Ireland: Haircut, Sir? 15% Off? "euro-Banks Set To Lose €Bns"
What - lose money? on an investment? but but but... It's an INVESTMENT. They can't do that... can they? And it wasn't even on a sovereign investment. It was too a highly leveraged private sector bank. If true, that is massive. The reason interest rates are so low on sovereign bonds is because everyone always gets their money back. If haircuts are back in fashion, bondholders will demand higher rates of interest. The BofE base rate becomes irrelevant. Oh, and if true, this will cause contagion. It isnt as if Spanish Bondholders are going to get their money back now is it? And what about Germany, even it will have to borrow more to shore its banks up who would fall over if their bonds are written down. And what about the ECB? Does it have many bonds that it owns outright? I thought that big fund it set up was used to lend money to bust countries and banks, and it took Irish bonds as collateral. What does that mean for the bonds it sold to finance all of this? Yes, Massive. My head is spinning, the world has changed. Glad you posted that, saved me the trouble. 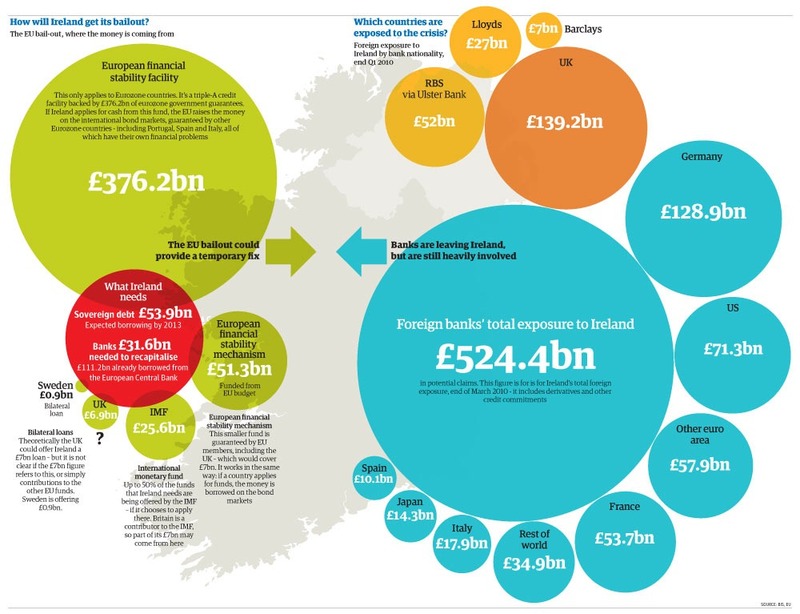 That's a really good diagram, looking at the big orange circle on the right hand side shows exactly what this is all about, answers visually that oft posed question "If Britain's not in the Euro, why are we helping Ireland out with loans ?" Germany takes over Irish banks. Cowen has something to spin the proles and try to get it through before he's kicked out. Irish people being stitched up. Edit: Btw, isn't this effectively a 15% (or thereabouts) devaluation? i.e. external liabilities fall by similar amount. Errr, no - HPC not on. If governments (not in the Euro nutcase zone) can't borrow money - they will print it. We're already paying £40 billion a year in interest and - incidentally, most of our debt is long dated. I don't know when people on here are going to get it. There is no future in sight where interest rates suddenly jump because, if that happens, the banking system will collapse. High interest rates will cause mass repossessions, a downvaluing of the assets that define each lender's capital position and bank insolvency. There is only one way out of this - that does not involve complete social and economic breakdown - and that is global inflation. Which is already on the way. The Euro will break up on the way - countries have to be able to set their own interest rate policy. Doesnt printing raise inflationary expectations? And doesnt that in turn lead to bond markets demanding a higher rate of return on their investments? The only way that the central banks can force prices lower is buy buying bonds, but then they become the only buyer. Sure, temporarily interest rates go down, but a withdrawal from the market by the central bank always leaves a massive gap that no one wants to fill. At that point interest rates will have to rise, and they will most likely rise sharply. Owning a home with a big mortgage is a pretty bad idea if this happens. The alternative, is that the central bank isnt able to exit, in which case a hyper-inflationary holocaust destroys the currency. Owning a home with a big mortgage is a good idea if that happens. So take your pick? Will the central bank QE enough to cause interest rates to rise, or too much, causing the currency to be destroyed? If you think the latter, take out a mortgage on anything. Aren't a large proportion of the senior bond holders the UK government (via RBS et al), who are also forking out 7bn to bail them out? No you haven't missed anything. Is this why banks are getting **** raped today? I get it, and have just exchanged contracts to buy a house to get 2/3rds of my STR fund to safety, 1/3 still in NS&I RPI-linked. The financial system is becoming highly unstable IMO and the chance of a nominal terms HPC is vanishing. More promises (debt) were made than can be kept so they must be diluted. Roll on the HPC in real-terms. Exciting times. Wage inflation on the cards then? Because goods price inflation isn't going to solve anything, if the people can't afford to pay back the debts your still going to end up with system collapse. There is no easy exit from this mess. Inflation is likely to get out of control, which will ultimately require a new currency to reset it all. No wonder in biblical times they had debt jubilees to stop this sort of problem from happening. It is not soveriegns taking a haircut. It is the bank bonds that are taking the haircut. This could result in the yields that banks have to pay to get their debt into the market rising, so raising their cost of financing, so meaning they have to charge more for loans and mortgages. Another result is that seeing as sov's seem to be not affected by this thier yield may fall. The net result is that Greek, Protuguese, Spainish and Irish banks have just had a big dose of pain delt to them and at the time when Mr Trichet wants to pull back the special liquidity scheme to stop these banks funding themseleves off the ECB heroin and to go back to the market and pay market rates. This could be the biggest "shoot yourself in the foot" decision since Frau Merkel opened her mouth about haircuts. Having said that I am sure that Germany wants a load of bankrupt client states that are dependent on it for cash, only problem is I can not work out why. The largest holder of UK Govt debt is the BoE. Do not forget we are paying most of the interest to ourselves at the moment. Fiat money, it's great. It's actually even more complicated than that. Like, why is Sweden offering to be such a good neighbour and help Germany. The following piece explains it, in part. It's long but well worth the read. The conclusion: find some sand and bury your head in it. My question is: the EU will do everything to stop this, including a bigger ESFS, bailouts, QE. But is that going to work at all anymore? Pavlov says 'it won't work' but I just can't conceive it. Where did I say that sovereigns were taking a haircut? There may be countries that will have to bail banks out as a result of the banks having to take a haircut. Only where the nations themselves hold the sovereign debt of other nations will they have to take a haircut. Pension schemes are the ones in the firing line. I bet they are readying their begging bowls right now for a visit to their local taxpayer. Money is like Energy - it can't be destroyed, only converted from one form to another. Money is also not like Energy - it can be spontaneously created by Central Banks - or by Irish Gangsters who have made a small fortune from minting their own faked pound coins. I thought money could be created, and destroyed? There wasnt as much money in the stone age as now, nor so much stuff to buy. Money moves in step with total output in a weird relationship that we all struggle to understand. You need more money to buy more stuff, and you need more stuff to allow more money to be generated. wont collapse the banks because they are allowed the lie about the valuation. No - the Bank of England say on their website that they expand the money supply to keep up with increased output and (rather counter intuitively) inflation. This is to stop deflation setting in - with a 'static' money like gold combined with an expanding economy would cause shortages of money and deflation of prices which has the destabilising effect of making debts unaffordable and default inevitable. cours,e thats what the Bankers want us to beleive, that rising money value is bad. In fact, if they issued more cash to cover real extra wealth, then there would be NO inflation OR Deflation. it would be flat. And bankers would be forced to lend to productive, wealth creating activity....and they would rarely be in a position of running out of cash. But they'll also have CDS on all this debt coming out of their ears. Who's underwriting all that sh1t? Didn't work out too well for AIG now did it. and then there will be all the stuff that Trichets already swapped. It's a tad more complex than at first appears, and let's face it if Merkin and co. have decided on a number, it's not going to be a number that causes her and her banks pain 'cause otherwise she'll be on the hook covering their capital funding shortfall. No, this is all about trying to get the Irish to pass the budget and keep the Euro 'together' at the moment I think. When Spain goes t1ts then we're into a different phase altogether though. But that's going to be a big bang I'm sure. It'll all be over in a day or two. This is where the 'financial terrorist' analogy comes into play- the system is effectively rigged to explode if any of the erstwhile gamblers look to be in danger of losing money. The problem being that their 'wealth' is in fact a bunch of IOU's that are looking more and more unlikely to pay off.